82nd recipient- To sell your soul is the easiest thing in the world. Ravindra is from Kolhapur. He arrived in Mumbai in 2004 to earn a livelihood, because of his family’s poor financial circumstances. He worked initially, for around 6 months, at a printing press, lifting the manufactured goods and loading them on to a truck for delivery. Post that, he worked for a courier company as a delivery boy, and has been working with them ever since. About his education qualification he told me …. ‘…. because my father was not educated, he could not progress in life beyond a certain level, and could not afford to pay for my education after my 10th Std. Ravindra’s father was far less educated than him, and Ravindra’s own education had stopped at the 10th Std, because they could not afford to study any further. Education, higher education, is one path that can break the curse of generations of poverty and lift one above the gray clouds, I feel. Had Ravindra not been 10th Std pass, I feel he would have, most probably, not got this job as a courier-delivery boy, because the profession requires the basic skill of writing and reading addresses mostly in English. So Ravindra having the perseverance to complete his 10th Std. by studying at a night school did lead him to us one day, is something I would like to believe. And because he met me, our donor Meghna could reach out to him, because I am simply just that one link between someone who wants to reach out to someone who needs assistance to better his livelihood. So how did I meet his fellow? Well, Ravindra had came to my place to deliver a letter, and while I was signing the receipt, I casually asked him did he walk or did he ride to my place? He told me he had walked, because he had a bike earlier but it was stolen and after that he could not (save enough money to) buy another one. That’s when I simply knew that he is someone we could reach out to. Ravindra’s father is a farmer and they have a half acre land in which they cultivate rice. However, it’s not enough to feed his family. Currently, he lives on rent with his wife and child at Prabhadevi. He has a younger brother who is also educated till the 10th and works with a Bank. The first five to six years working as a courier delivery boy was very hard for him, because he could not read English properly, and moreover, he did not know the Bandra west area at all, so he had a very hard time locating addresses. But slowly, he educated himself to read English and to memorize locations. That period was the hardest time of his life so far, he told me. “… considering I am just 10th Std. pass, the job I have, delivering letters, is probably the best I could have had with such little education behind me. So I really like this job I am doing. I have been able to book my own flat, in a very distant suburb of Mumbai/Thane, and lately I have also been able to reinforce our house back in the village. It was never a strong house. Furthermore, it is this very job that has made me capable of helping many young people from my village and district find jobs in Mumbai. See, where ever I go to deliver letters, I always ask if there is any job opening, and if there is one then I recommend an acquaintance or stranger who is looking for a job. I have helped about a dozen or less people get jobs in Mumbai in this way. I once again pressed him to tell me what he really likes about the job he does. I remembered a quote from a book, I think most of us most have worshipped this book during our senior school or early college years, – The Fountainhead. True. Let us never negotiate out of fear! But let us never fear to negotiate!! I asked him who is his best client/s and why? At this point I decided not to transcript his interview anymore, even though he did continue speaking to me about some more things from his life. I decided to stop right here while transcripting his interview, so that I can leave you with just one thought – “Let us, wherever and whenever possible, keep a vessel of water outside our doors for such countless and nameless people; just like some ‘sensitized’ people keep water outside their windows to serve Birds. Happy Ganeshji Chaturthi to you all, my dear friend and acquaintances. 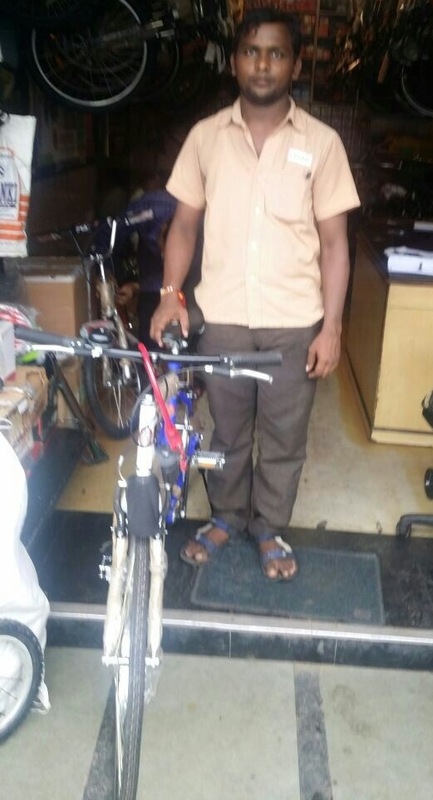 Thank you to Meghna Rodrigues and family for donating this new bicycle to Ravindra; he contributed more than half the cost of the bike. Thank you to Siddharth for Ravindra’s pic with the bike. I saw Sohanlal riding while I was on a walk. Though he seemed very old he rode sturdily, even though his old dilapidated bike seemed to be a few hours away from surrendering to her gross misfortune. I decided to stop him and chat with him, and he obliged me. Sohanlal is from UP, and resides at Bandra west. He has been in this profession since more than 50 years. He is educated till the 4th, and could not study anymore because they did not have the money, even though he was very keen to study further. Even the agriculture land his family continues to own in the village is not cultivable every year, because of the lack of rains and even lack of irrigation-water canals. Before he came to Mumbai and joined the laundry services profession, he worked for 16 years selling cloth for a cloth merchant. He was keen to do his own business, but he could not establish one because could not find the necessary finance to buy the cloth from wholesalers. Twice in the past, two of his bicycles, along with his customer’s clothes, have got robbed, and both times from Pali Hill. Luckily, all his affected customers did not demand that he pay them for the loss of their clothes, and that was because of his old age, he says gratefully. Sohanlal has 3 daughters and one son, and his son is married and shares the work with him. Two of his daughters are married. All 4 children are educated at the school level. I asked him why did he choose this profession of ironing clothes…? Sohanlal’s belief reflects his daring. It is the business of the very few to be independent; being independent is a privilege of the strong indeed. And whoever attempts it, being self-employed, independent, proves that he or she is probably not only strong, but also most-daring beyond measure. I had read this someplace and he reminded me of it. I asked Sohanlal which has been the happiest period of his life so far? He replied, “It’s only now, lately, sadly only when I have become old, that I am now beginning to see what I can say are pretty good times. I am making enough money to look after my family, (pause) but I feel sad that a better time has come for me when my body has got old. I wish this stability had come a little earlier. I believe, the affection and appreciation from his immediate family is what (makes Sohanlal ride his bike like a far younger person!) keeps him so able at 72 and love his work too. His will, right from the days of his youth, ‘to be independent’, along with the appreciation and gratitude of his family, is what really keeps this young man rocking! Suddenly, Sohanlal smiled; his eyes gleaming in delight; He had got transformed into a little boy dying to reveal what he has been hiding all along in the bulging pockets of his shorts. Hahahahahahah! Lovely!! I complimented him. I asked him to repeat it, such was my delight. He was so happy, and this time said it with even more vigor!! Sohanlal left me in not just pearls of hearty laughter, but also enriched with his colloquial expression and raw wisdom. 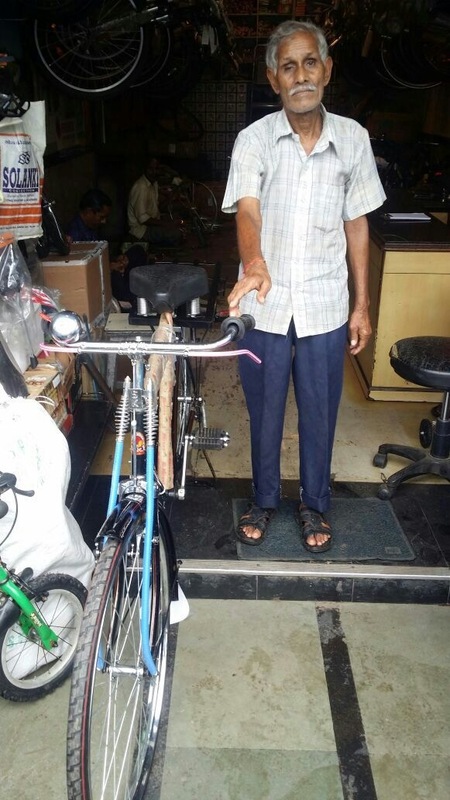 Thank you to Varsha Kalani for purchasing this new bicycle for Sohanlal; he contributed more than half the cost of the same. And thank you to Kohinoor Cycles (http://kohinoorcyclestores.blogspot.com/) Siddharth Vora (https://www.facebook.com/siddharth.vora.58?fref=ts) for the good discount and service. Thank you to Siddharth for Sohanlal’s photo. 80th recipient – To ease another’s aches is to forget one’s own. He mentioned his parents did not have any child after him because they were facing financial difficulties, and had decided to not have anymore and share whatever they could provide with just their one and only child. However, their financial challenges continued through his childhood, forcing him to leave school after passing the 8th and when he was a teen he had to leave his village to earn a livelihood; He migrated to Mumbai when he was 15-16. It was his parents who advised him to migrate to earn a better livelihood. His family has always owned agriculture land in the village, and they still do; but the lack of rain and irrigation-canals has prevented them from continuing farming as their source of livelihood. They have perpetually suffered from the lack of water; but last year when they had grown corn, makai, unfortunately it rained so much that their entire crop production was destroyed! What an irony ya, ‘no water’ and ‘too much of water’, both are fierce-destroyers of not just crops, but even of the hopes, dreams, and ambitions of those who grow and nurture them; not just crushing the raised heads of crops to ground level, but even forcing the unfortunate human victims to impoverishment, forcing many out of the borders of their ancestral homes and towards foreign lands – internal migrations. His own family consists of two sons and two daughters, all educated.  They live in the village, along with his widowed mother; he lives alone at Grant Road at a rented space. Lalsingh began selling milk ten years ago. He rides 60 to 70 Kms daily, delivering milk to residential and commercial premises in central and south Mumbai. Before he was a milkman, he worked at a Hardware store as an assistant, but did not like the work and left it after almost a decade. The hardest times he has faced were during his childhood, when agriculture could not feed even three stomachs, and his was just a child’s. He had to leave his village at 15 in search of an employer more dependable than agriculture, one less dependent on the whims and moods of weather. That’s when he migrated to Mumbai and took up the job at a Hardware store and kept at it for almost a decade, until he chose to be independent, even if he be a milkman. I asked him, ‘Considering you were forced to leave your studies midway, and your home, your village, because of financial difficulties, now during your middle-age what do you think you would have been able to achieve, had you been a graduate, had you a professional job or if you were running your own business? What would you still like to achieve in spite of the lemons life seemingly gave you? Lalsingh replied, “If I had been able to complete my education I would have reached a position by now where I would have been able to help people who are unfortunate, and less privileged. And even though I could not do the things I had wanted to, things a child’s mind dreams of, even now I would still like to do something substantial for others with whatever little life has given me so far, or the abundance it may give me in future. For that, I have identified a couple of less privileged people around me where I reside at Grant Road; and one day I want to help them rise above their unfortunate circumstances. Because it’s our own neighbors that I think we must first help, before we reach out to those further away, correct? Such a being, even though he will walk away from our lives forever, is someone who will take along something with him something eternal, something no one can steal from him, something no one can make him poor of, and that is – our good wishes and our blessings for him to be able to achieve his ambition for social welfare that he continues to harbor within him and which is aimed first at his own neighbors before he reaches out to those of others. I have met many recipients of our bicycles, like him, who harbored ambitions to help those they consider less fortunate than themselves; and it makes me wonder, ‘What does it take to harbor such ideals of charity when yourself have what many consider ‘little’? 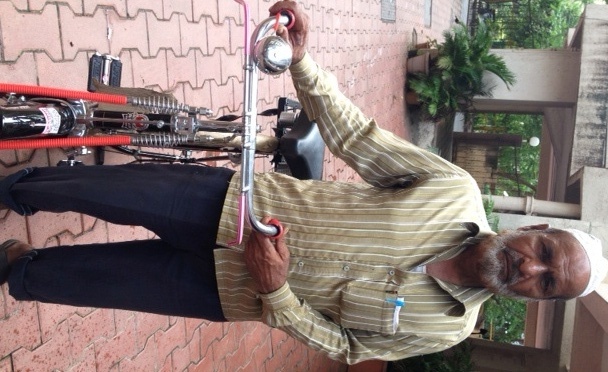 Thank you to Varsha Kalani for donating this new bike to Lalsingh; He contributed half the cost of the bike. And thank you to Kohinoor Cycles (http://kohinoorcyclestores.blogspot.com/) Siddharth Vora (https://www.facebook.com/siddharth.vora.58?fref=ts) for the good discount and service, and sending me his pic. 79th recipient – I have reached so far on my own strengths, not thinking of my weaknesses or misfortunes. Nana lives at Dharavi, and belongs to Tamil Nadu. He could not speak a word of Hindi, so I had to call upon his cousin brother to become the translator between our different cultures. I met Nana while on my regular morning rides; he was struggling pulling the weight of his food-goods on a dilapidated old bicycle, so I stopped to chat with him. Nana is educated till the 4th Std., due to financial difficulties he could not study any further. Post his incomplete schooling, he began working as a daily wages agriculture-laborer at his village, just like his father was. He began selling Idlis in Mumbai 5 years ago, as it would provide him a more regular income and help him be ‘independent’ too. Ambitious fellow, is what I thought of him. He has a son and daughter, 4, 5, and both go to a school. He wants to educate them both. Nana wakes up at 4 – 5 am and cooks the Idlis, chatni, sambhar, wadas, himself. His wife does not cook what he needs for his profession; his wife cooks, but only their home meals. Bravo, I thought, he truly is a self-reliant man, at least as far as his profession goes. In fact, that reminded me, earlier an Idli seller, Mani, whom we had donated a bike to, too had told me that he himself cooks the produce meant for sale. Was there an unwritten law amongst such professionals, the Idli-walas, that they be self-reliant for their professional produce, I wondered and admired if it were true. 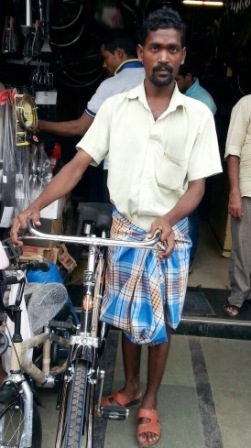 I asked him what will he do with his old bicycle, now that he will receive a brand new one?, He said he will hand it to his brother who sells Idlis too, but does not have a bicycle. After he left, I wondered, how much do we really need to be happy? How much? Which also made me think, – if him earning Rs 300 to 600 a day is ‘happiness’ for him, how terribly impoverished a life did he and his family lead until then?!!! 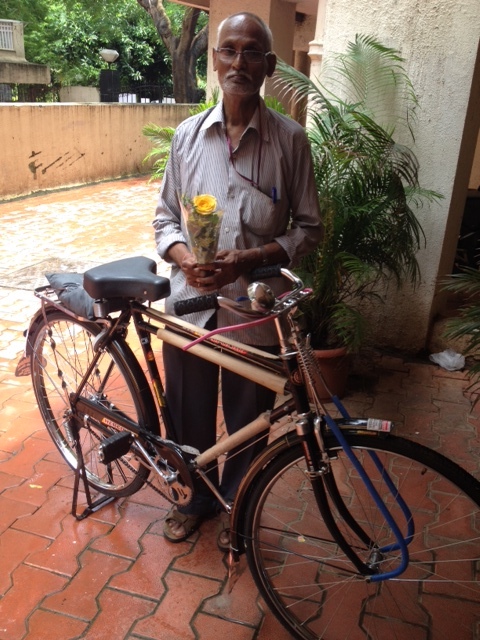 Thank you to Naga Raj for donating this new bicycle to Nana. Nana contributed nearly half the cost of the bicycle. Thank you to Kohinoor Cycles (http://kohinoorcyclestores.blogspot.com/) Siddharth Vora (https://www.facebook.com/siddharth.vora.58?fref=ts) for the good discount and service. Thank you Siddharth for sending me his pic. Incidentally, when he arrived in Mumbai first back in 1986 for a job as his family’s financial circumstances were not good, (most immigrate to Mumbai even today for this very reason), and for that reason he could not study beyond the 10th Std, he worked with a film production company, their Edit suite, belonging to Mr. Kholi, a close relative of the legend actor-director-producer Dev Anand. Shivdan began delivering milk from 1993, and in a day delivers around 100-125 liters. His day begins at 5.30 am. He has two sons and both study in school, back in his village. Hmmmmm True. Everything shrivels without rain, without water, people’s ambitions, dreams, along with their spirit, their beautiful skin, and bodies. Hmmm, a lot similar to what the lack of appreciation and kindness can often do to us. He replied, post the film company job he worked for a well known caterer who catered food for wedding events at a well known wedding Hall in Khar west. And what he told me about his experience with them made me laugh out loud!! Shivdan said, in response to my queries about that job – ‘…. the job with the caterer was pretty okay, washing dishes, serving the guests, etc, However, I could not continue there for long. They served great meals, to the middle class and even upper middle class guests they catered to at weddings, but, when I would eat those expensive and delicious dishes post the wedding event later at night, I began to fall ill! I would get upset stomach and feel uneasy all night and day, the next day. Then he cracked up! And then I cracked up too!! And it’s only then that I realized he has finally shown some emotion for the first time even since we began chatting! Until then, he had sat across me with a disinterested kind of poker-face! He had shown no emotion nor expressions from the word go! Shameem lives at a Bakery in Nandi Cinema lane opposite Bandra Station west. 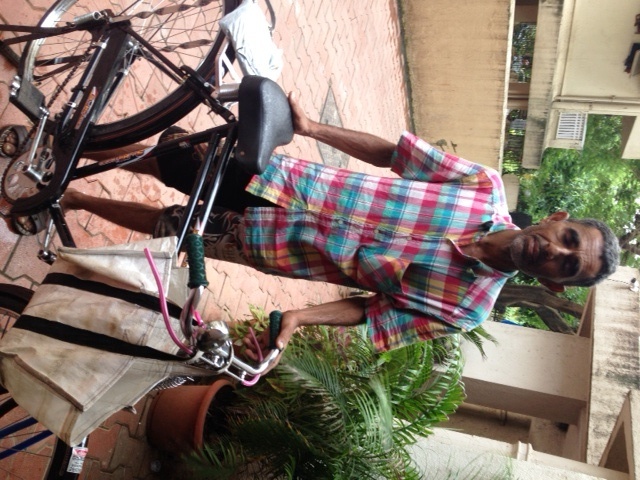 He bicycles from Bandra to Null Bazar (South Mumbai) daily, to deliver the Pau and Biscuits. It must be around 20 Kms one way, I think. He has been in this profession since 32 years. He is originally from UP, and his family lives there still. Shameem arrived in Mumbai around 40 years ago. He has five children, 3 daughters and 2 sons; All his daughters and his eldest son are married. He added, ‘unlike many people who do not push themselves to educate their daughters, I never hesitated to spend my earnings on their education, so all my children are well educated. About his profession he said, ‘I like my profession, because I am independent, I am my own boss.’ And once again, his eyes shone with pride. The most difficult period of his life was the death of his wife, nearly 20-22 years ago. She died during child birth, when she had twins, and one child died along with her. However, he never remarried, and thereafter he says he devoted himself to bringing up his children singlehandedly, trying to play the role of both parents however challenging it was. I asked him what other challenges has he faced that may have overwhelmed him? MOST IMPORTANTLY- Shameem paid nearly half the cost of this new bicycle. The balance was paid from the voluntary donations we had collected from various past recipients of used/old bicycles. The following past recipients paid for it by donating amounts varying from Rs 100 to Rs 500: Sofikul Shaikh – Coconut wala; Chaurasia – Bhel wala; David – Bread wala; Babu Prajapati – Assistant Mason and Carpenter; Rakesh Kumar – Dhobi; Rajesh Sahani – Carpenter; Amit Sahu – Kulfi Falooda wala. Thank you to all of them, and to our past donors who had donated new bicycles to make this possible. 76th recipient – Dabbang Vijay Patil! I happened to meet Vijay at Worli, during my morning ride, near the old passport office, when I noticed an old man riding at a snail’s pace, ahead of me, a rickety old rusted bicycle, with a wobbly back tyre; I rode slowly besides him to enquire about his profession…. and asked him if he would like us to buy him a new bicycle, provided he is willing to bear a part of the cost of the same. He agreed. Vijay is from Murud-Janjira, Maharashtra. He lives in Mumbai on rent, with his niece; he has a rented house in Panvel where his family resides. He is now 70, he has worked all his life, he has educated his 5 brothers, helped his sister get married, and as yet he does not ‘own’ his own house in the country of his birth. Vijay arrived in Mumbai as a teen; he had to forgo his education to earn a livelihood for his family, as he was the eldest child. He had 5 brothers and one sister. His father was a teacher. Vijay has one son and one daughter. (His second daughter, married, died at 35 due to an illness.) His son is an Electrician at Panvel. Vijay used to work at a Spinning Mill at Parel-Lower Parel and it shut down during the Datta Samanta led union protests period that lasted several years. He was around 40 when the Mill shut down, and thereafter he could never find permanent employment. Vijay has been selling milk early in the morning from the days he arrived in Mumbai as a teenager. After he lost his Mill-job, he took up the delivery of milk and newspapers regularly. He also does odd jobs now and then of a security guard, clerk, peon, and even a ‘hamaal’ (coolie) as and when the opportunities come his way. He still does all these jobs, although he is now 70. Vijay told me he is feeling very obligated that we are helping him purchase a new bicycle, even though he is a complete stranger to us. So, simply out of curiosity, I asked him if he has done something similar, randomly helped a complete stranger? He replied, – “I live at Worli, near the Petrol Pump opposite the old Passport Office and Glaxo Pharma; and at this busy traffic junction many vehicular accidents have taken place. If I see an any accident occur at this spot, or any place where I happen to be walking or riding, I ALWAYS rush to the accident spot immediately!, to offer any help I possibly can, in my own humble capacity, to the victim/s, if any. And on many such occasions I have taken the injured/accident victims to Hospitals. I have never run away from such an event or any accident spot. Even if I happen to be home, and I come to know an accident has occurred at this junction, I always rush out towards the spot to help the victims/injured, if any. ‘…even when I was young! ?’ Are you kiddin me?! Dude, ‘Young’ is an honor I would bestow on him even today! That is what I thought looking at this weathered man seated in front of me who had many front teeth missing and claimed he was 70! Furthermore, actually, my question to him had been about any ‘random’ acts of kindness he may have performed or must be performing; and from his reply I was pleasantly surprised to realize that VijayJI had consciously practiced, or should I say cultivated, acts of true altruism :- To save strangers in their most critical hour of need!!! When the distance between life and death is a bridge made of a single strand of the most beautiful silk. Later, it made me wonder, ‘How many souls must VijayJI have saved in such manner…”? However, thank God I did not to ask him this idiotic question, as it would be derogatory towards all those who harbor the spirit of such altruism. On asking him this question I realized, a time comes in our lives, sometimes, when something else even more precious makes up for the precious words that may fail us on such occasions; – the tears that suddenly invaded VijayJi’s eyes, when I asked him this question, were, for me, his sincere and humble response. What took me by surprise was that he felt so much gratitude even though he was willingly bearing nearly half the cost of the new bike that we were donating to him! Does this happen because those who feel that they are under privileged never receive such help from those who they feel are privileged!? Maybe that is why something that we may feel is so tiny a deed and expense on our part moves the recipient/ benefactor of our kindness to such an extent! In the accompanying photograph, VijayJI is holding a beautiful bouquet of two roses; one red, one yellow, he said he purchased it to gift it to us, for my dear friend KS and Deb Mohan and his wife. I removed one rose out of that, the yellow one, and adorned his bicycle handle with it. Because he deserved it’s beauty as much as us. 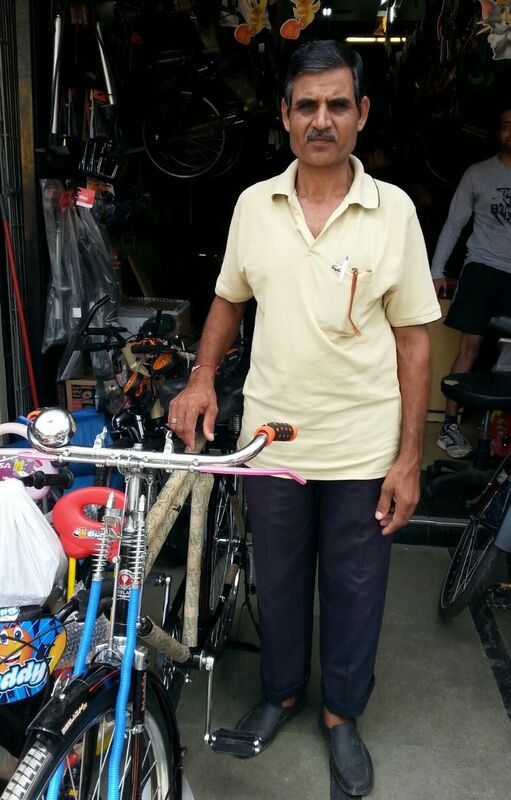 Thank you to KS, and Deb Mohan and Beni Kithan, for helping VijayJi purchase this new bicycle.